Arrange data into a suitable format for the InDesign template to understand. Setting up the InDesign template is an one-off job, with one sample product entry. You write the XML transformation code once. 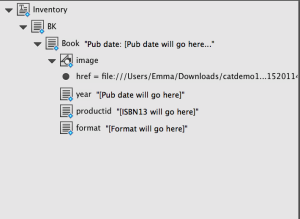 Then, when you import the data, the single-book template replicates itself to create as many catalogue entries as there are product records in your data — potentially thousands and thousands of catalogue entries with a single click. Then reuse your template and code for the next season’s catalogue. Download the files here [zip file, 15mb]. It contains an InDesign template. Here’s the structure pane of our InDesign template, showing how each entry will be structured: we’re going to need to whittle our ONIX down until we’ve got an XML file that matches this structure. Open transform.xsl: this is how the transform.xsl file looks. Line 1 tells the computer that this is an XML file. and gives a bit more information about this part of the file – which is that this code is XSL. If you look ahead to line 24, you’ll see its sister, the closing tag. We know it’s a closing tag because of the backslash. Now, next time I want to give my office location, I don’t have to spell out the whole address. The variable “address” is a shorthand way of saying the whole thing. Back to our code. The next lines define three variables on the next lines: one called form, one called date and the other called isbn, so we can use them later. The values of the variables come from the ONIX file. The data tagged up with ProductFormDetail is assigned to the variable called “form”. Similarly, the value in the ONIX tagged up as PublicationDate is saved as the variable date. Lastly, the ONIX tagged ProductIdentifier[ProductIDType = ’03’]/IDValue gets set as the variable called isbn. There are two ProductIdentifier tags here and this code selects the one with ProductIDType 03. Line 8 defines another XML tag, called <image>. Because it’s an image tag, it takes an href attribute. It uses the isbn variable, defined above. Line 9 says “Get the value of the date variable”. It also amends the date format. First, get the value of the date variable, which is 20120228. Count to the 7th digit, which is 2. Then get the 2 following digits, which would be 28. Then put a backslash in. Next, use that same date variable and get the fifth number, which is 2, and then the next two digits, which gives you 02. Finally, get that same date variable, and get the first number, which is 2, and then the next four digits, which gives you 2012. All of that gives you 28/02/2012. The next line, 10, is also an <xsl:value-of>, and we use our isbn variable again. This line produces another XML tag called <productid>. All these tags will be used in the InDesign document we’ll see in a bit. On line 11, we have another XML tag, called <format>. But what to put in this tag? The syntax says “Choose from the following: when the ONIX form variable is B104, put in A Format Paperback. When the ONIX form variable is B105, put “B Format Paperback” in our new <format> tag.” And so on. Use the files you’ve downloaded to practice, and then use your own company’s ONIX file to have a go. Then, tweak the InDesign template so that the colours and fonts are to your taste, and produce your own catalogue. Raise a ticket for more guidance. This demo is a deliberately pared-down example. You’ll likely want to include more information such as the title, the blurb and the price. I can recommend A Designer’s Guide to InDesign and XML which contains even more templates and excellent descriptions of how to start using InDesign programmatically. Do you have a one-page summary? What are the technical details behind the service? ​What happens if you do a significant upgrade that goes wrong? Would we be able to get our hands on our data should we wish to move? Consonance is a General Products Ltd web application. © General Products Ltd. Consonance® is a trademark registered in the UK.